During these past six months, I have rededicated myself to investing in my overall health and fitness: I have a monthly membership to a fitness center and have my own personal trainer, who trains me hard twice a week (hi, Brittany!). When it comes to my health and fitness, these days I am not merely working out for aesthetics: I also know that this time around, I am in it for the long haul, and that this is a lifestyle, not a hobby. 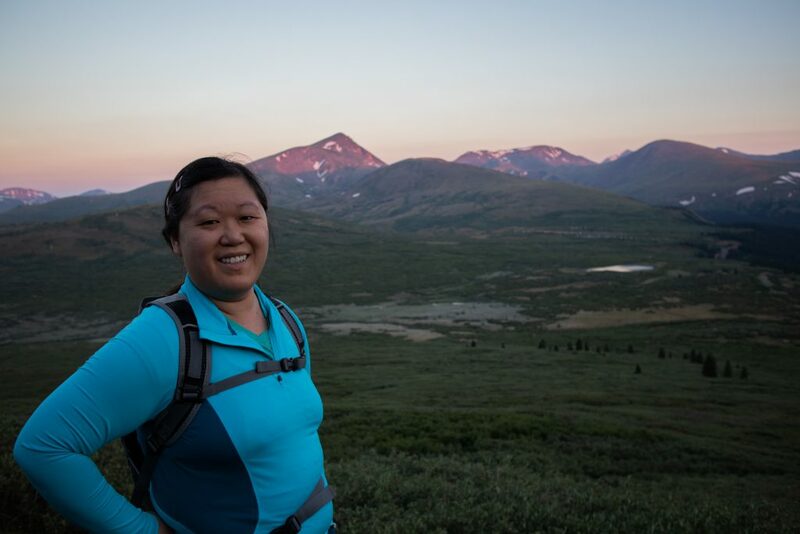 Along the trail towards Mount Bierstadt: look at the beautiful sunrise behind me! So, what better way to test my endurance than to hike a 14er (if you had asked me this time last year about hiking a 14er, I would have promptly said, “No thank you!”). This is exactly what I did over this past weekend with Ryan. 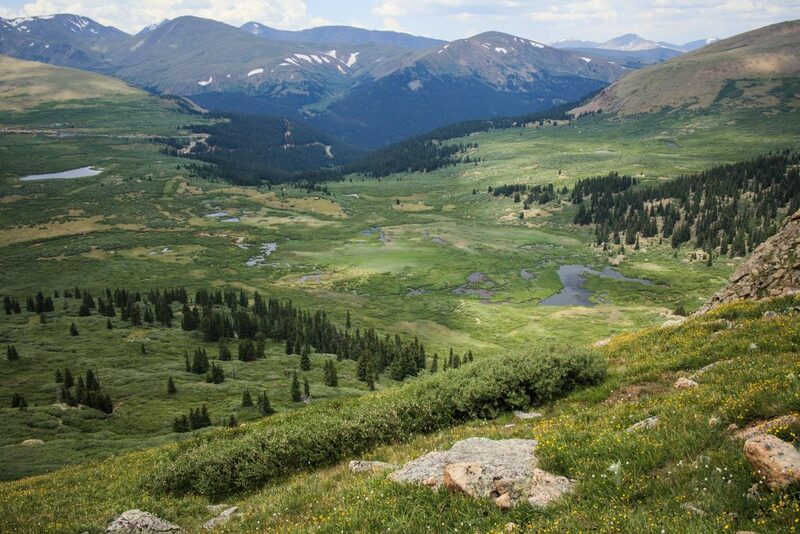 For those who aren’t familiar with the term “14er”, the term refers to mountain peaks that are 14,000 feet and higher, and Colorado boasts over fifty of them alone. These mountains vary in difficulty in terms of elevation, length of hike, and terrain. Mount Bierstadt in the afternoon, with storm clouds rolling in. 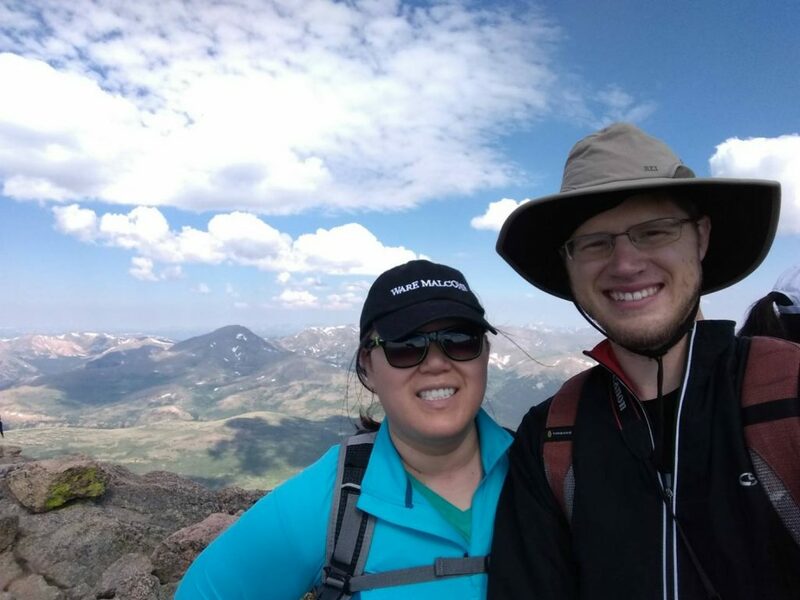 It was only last Thursday (July 5th) when Ryan and I decided to hike Mount Bierstadt, which sits at 14,060 feet and is considered a Class 2 mountain. Before this, we had only driven up Pikes Peak and Mount Evans, so Mount Bierstadt was going to be the first 14er for us to hike. I admit, I was a little nervous about hiking it, even though as Ryan researched about the mountain, he said that overall, other hikers seemed to think that the mountain was an ‘easy hike’. 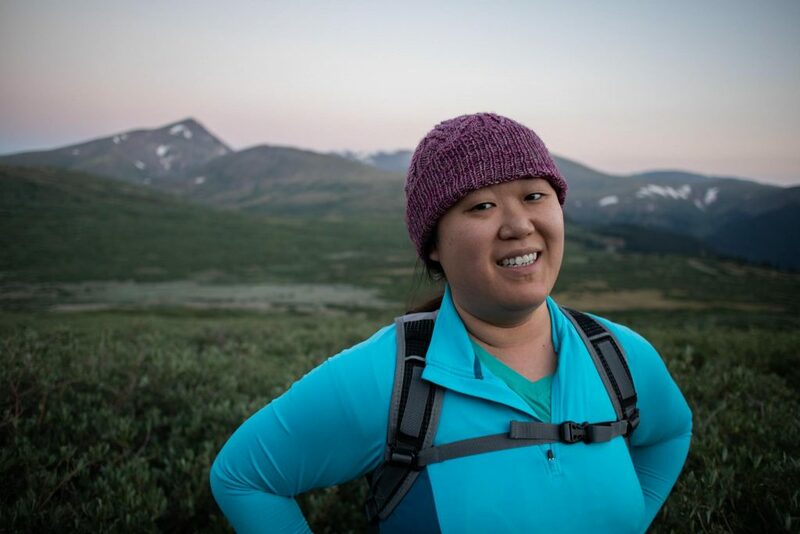 I read over a blog post by Laura Skladzinski at 50by25 about her experience with Mount Bierstadt, and the post helped me prepare mentally for the challenging parts of the climb. The whole hike up and down Mount Bierstadt took us about 9.5 hours round-trip, for a total of 6.9 miles and 2,729 feet in elevation gain (we already started at about 11,000 feet at the trailhead). The trail is very popular among people of all fitness levels, including families–although I am not sure how many of these families made it to the summit. Needless to say, the whole hike exhausted us out, but we made it to the top with relatively no altitude sickness symptoms. Hoorah! Anyhow, we did take away some lessons from the whole experience, which will be handy for those of you who are curious to try out a 14er in the future. Be prepared with supplies. We made sure we packed a good amount of food, drink, and other supplies in two backpacks for the hike. We also sported layers despite the forecast calling for 100 degrees in Denver: it was only about 30-40 degrees during our hike in the Mount Evans Wildnerness. I was wearing my (handknit!) winter hat in the morning, and then switched over to a baseball cap as the morning/afternoon rolled on. Trust me, we used ALL of the above on our round-trip hike, with the exception of the umbrella (we made it back to the car before the storm rolled in). Two other items we wanted to bring (and will bring on future hikes) was bug spray and a small first aid kit. We ate our snacks and drank water all along the route to/from the summit, and that helped alleviate any altitude sickness symptoms we would have experienced. GO EARLY or risk getting caught in a thunderstorm/rain. We woke up around 3am so that we could drive up Guanella Pass to the Mount Evans Wildness parking lot before 5am (and the parking lot was nearly full already). We started on the hike around 4:50am, reaching the summit approximately 10am, and arriving back to parking lot around 2:30pm. On our descent down, there were a couple of moments where clouds rolled in, and we experienced very light drizzle. However, we still saw many people heading up the mountain as late as 2:30pm when we had arrived back at the parking lot. Ryan kept telling me about how we should be below treeline before noon to avoid the risk of being caught without shelter in a storm (fifteen people were struck by lightning in 2015 on this exact mountain due to being above treeline/at the peak of Mount Bierstadt too late in the day). Even in the early morning, there were plenty of other hikers attempting the summit with us. Hike on a weekday (if you have that option). As the morning rolled by and we continued along our journey, we realized it was a mistake for us to go on a holiday weekend, since Independence Day was only a few days prior. As I had mentioned earlier, the parking lot was nearly full when we arrived before 5am, and we saw LOTS of hikers on our ascent and descent. A lot of the breaks we took along the way were actually due to ‘traffic jams’ of people rushing to the top/rushing back down. I get anxious when people are trailing right behind me, and I’d rather let them pass me than for me to feel pressured to speed up and then inadvertently hurting myself. Action shot of me crossing the creek in the afternoon on the return trip. Wear proper footwear for hiking (because this really isn’t a walk in the park). Ryan and I both wore hiking boots, and our feet still hurt at the end of the journey. Our boots had proper ankle support (to prevent ankles from rolling), and helped us traverse the rocks along the way. We also crossed a creek towards the beginning/end of the hike, so we needed to make sure our shoes had good grips to prevent us from slipping on the rocks. We saw other ‘hikers’ walking by us with sandals and flip flops, which caused me to scratch my head at that sight. Trust me, your feet will thank you when you wear proper shoes for a hike like this one. 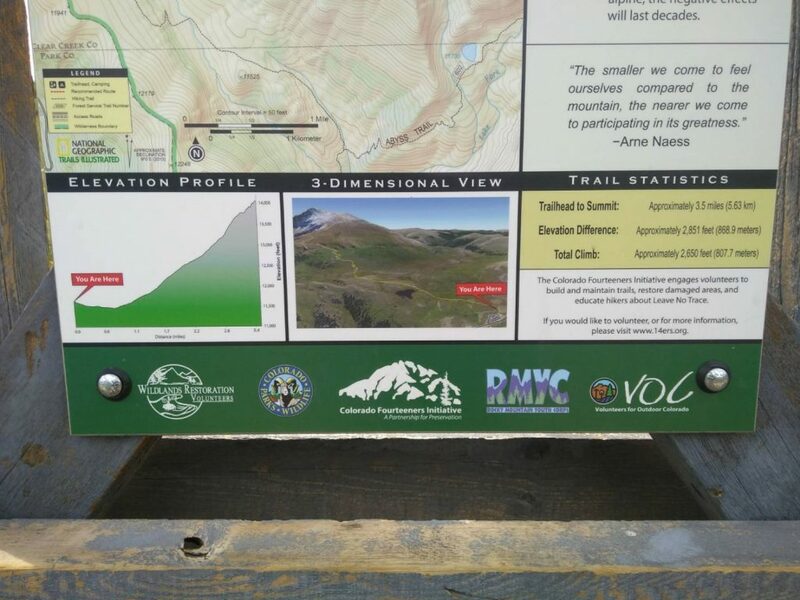 This sign is at the trailhead for Mount Bierstadt/Mount Evans Wilderness. Look at that altitude climb! 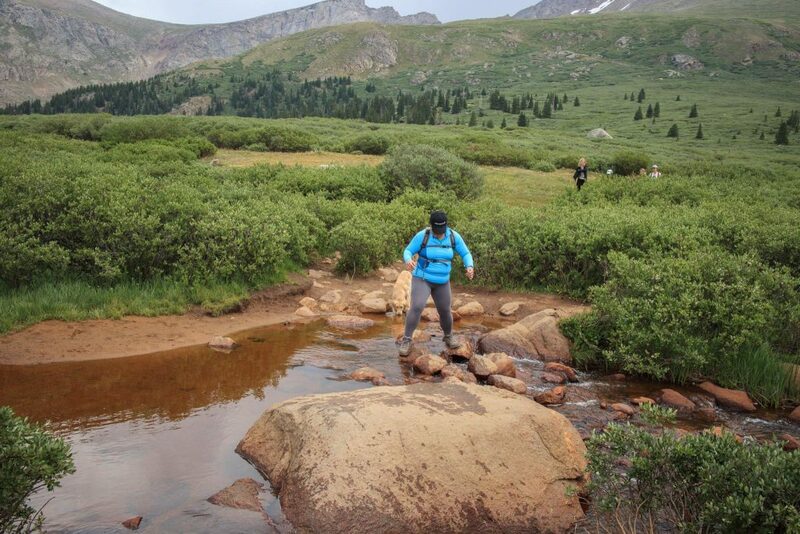 Have a certain level of fitness prior to attempting this (or any) 14er. Regardless of what you may read on other blogs or websites, this isn’t an easy hike! Mount Bierstadt may be considered one of the ‘easier’ 14ers, but that is all relative, and probably from the perspective of a more experienced mountaineer. If you have young children, I wouldn’t recommend doing this whole 14er, unless you want to be carrying your children up the summit on your back. As I had prefaced earlier in this post, I have been diligently working with my personal trainer for the past six months to condition myself for something like this. I still had trouble with some aspects of the hike (making sure I was taking deep breaths, engaging the right muscles and not the wrong ones, etc. ), and even today (three days after the hike), I still feel a bit sore from the hike. Dog owners: keep your dog leashed and behave yourself. We unfortunately were in contact with dog owners behaving badly while on our hike: many of them had their dogs off-leash (which is NOT allowed in the Mount Evans Wilderness), and some of them didn’t feel the need to preserve the environment by picking up after their dogs (if you get my drift). Leave no trace, and if you really find it difficult to take care of your dog while on this hike, leave your dog at home. YOU WILL SURVIVE. An afternoon view from the trail on our return trip down. Beautiful colors and landscape! It’s all about the journey (so don’t be in a hurry). There is a bounty of colorful wildflowers along the way, and in general, the landscape towards the summit is very diverse. We traveled through wetlands, dusty dry rocks, and shrubs. It was nice to take the breaks to enjoy the view around us. Another unfortunate instance we had while on our hike were a few rather impatient hikers. At this point, Ryan and I were slowly hopping from rock to rock, and my foot cramped up so I had to slow waaaay down. A hiker approached RIGHT behind me and audibly sighed out of frustration that I was taking my time. Seriously?! There was plenty of space for the guy to go around me, but he chose to tailgate me and make me nervous. Don’t be a jerk. Everyone has their own speed and if you’re THAT impatient with others around you, then wake up much earlier to go hiking, or visit a less-popular 14er. 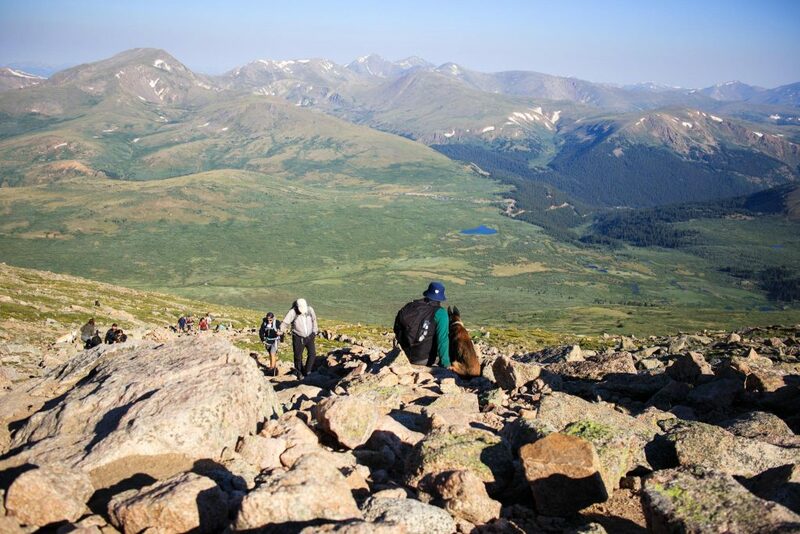 When we reached the top (after scrambling up 250 feet of rocks with not much of a dirt path), the experience was surreal: many groups of hikers hung out at the summit, eating and celebrating the accomplishment of climbing Mount Bierstadt. Ryan and I at the Mount Bierstadt Summit. 14,060 feet conquered! We took the requisite selfie at the summit, but forwent the cardboard sign that social media has famously made ubiquitous. There were plenty of other hikers who had their signs though, and Ryan observed that there were some who ‘cheated’ with their sign, not ascending all the way to the summit, but only hanging out on the shoulder of the mountain. 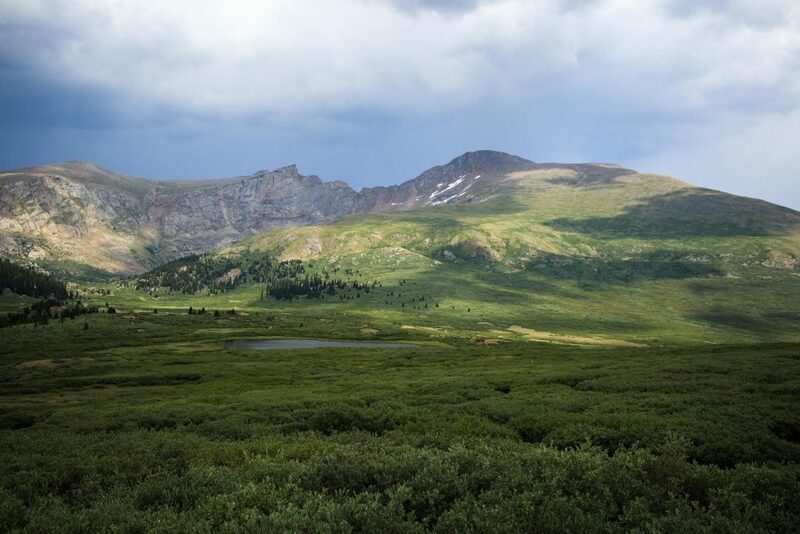 A few days after hiking Mount Bierstadt, we still feel content with our accomplishment, but we are also satisfied with the idea of climbing one 14er per year–we are definitely not interested in checking off all the peaks on a bucket list. Perhaps we will do Quandary Peak and Mount Elbert over the course of the next two years. We shall see. Your turn: if you’ve hiked a 14er, what are some other takeaways you want to share? If you have never hiked a 14er, were the takeaways in this post helpful?